There have been some changes to the way high school students apply to FAFSA. Families need to know what the changes are, what the important dates not to miss are, and how to get students graduated from college not mired in debt. Financial education speaker and the author of “10 Things College Students Need to Know About Money” Shay Olivarria will be facilitating a FREE workshop in San Diego, CA to help families figure it all out. In this dynamic one hour workshop students and parents will learn about the changes to the FAFSA application, scholarships, student loan types, and repayment options. Families will leave with a handout of important terms, tips, and dates. Graduating from college is not just about having the grades to get in. It’s about finding a school that’s a good fit, paying for it without going broke, and creating a network to build a career. Bring a pen or pencil. This is a workshop (you’ll be engaged) not a lecture. Early Bird ticket holders will receive a free copy of “10 Things College Students Need to Know About College” at the event. If you don’t show, you don’t get your copy. Books will NOT be shipped. Yes. Seating is very limited so tickets will be necessary. Showing your ticket on your phone also works (save a tree). Yes. Whoever shows up needs access to a ticket. If you booked a ticket for yourself and now your cousin wants to come instead, that’s fine. Have a high school grad that’s headed to college? Did you learn some financial lessons the hard way and prefer that your child not make the same mistakes? You’re in luck! This September financial education speaker and author Shay Olivarria is hosting a FREE (yes, that’s f-r-e-e) webinar to give college freshman a leg up. – Where to put financial aid money for best money management practices. – How to spend money, have fun, and be responsible. – What accounts to open to build credit scores. – Where to put your pennies to become wealthy. – Pros and cons of available personal finance apps to leverage your current behaviors. If you’ve read “10 Things College Students Need to Know About Money” you know that I am a HUGE advocate of young people investing from retirement as soon as they have earned income. For many people that time is while in high school or college while you’re working part-time or eeking a living out of financial aid. Often, young people don’t know how to open an Individual Retirement Account (IRA) or don’t think they have enough money to open one (get my list of investment accounts you can open for less than $100 here). Designed to help people with little money or no access to a retirement plan from work. The funds you invest are NOT tax-deductible but you also can take them out whenever you like without penalty. The best part? There is no minimum amount required to start an account and according to Forbes, ” additional contributions only have a minimum of $5.” The goal is really to get you into the habit of investing when you are young and have few dollars. The return isn’t great (think 1% or 2% per year) compared to a regular traditional or Roth IRA or 401(k)/403(b) but starting now with a few dollars and little interest is better than not doing anything. Once you’ve grown a nest egg big enough to open a traditional or Roth IRA, or you have a job that provides a 401(k) or 401(b) hopefully with matching, you can roll the money over into a new account. Click here to find out more about myRA accounts. A virtual book launch is an opportunity for you to ask me about the book, win some cool gifts and score an AMAZING discount on the book. I’m so excited. Sign up to receive my emails and get another gift. See you Wednesday, June 8th between 6:30pm and 8:30pm Pacific Standard Time. 10 Things on Kindle for $3.50! Order Now! I know you’ve been thinking about ordering copies of 10 Things College Students Need to Know About Money for your children, grandchildren, cousins, neices and nephews but you wanted to read it first, right? You wanted to make sure that it was a good read with real information about personal finance. Well, here’s your chance! 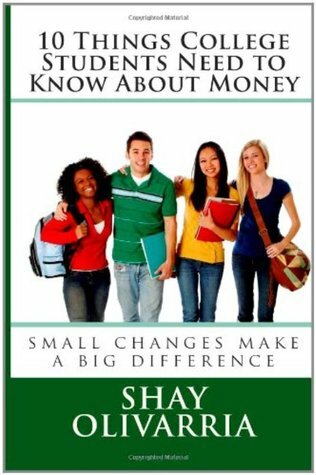 10 Things College Students Need to Know About Money is now available on Kindle for only $3.50 per download! Download yours on Amazon.com now. Click the image to read more about Shay speaking at Cal State Long Beach. 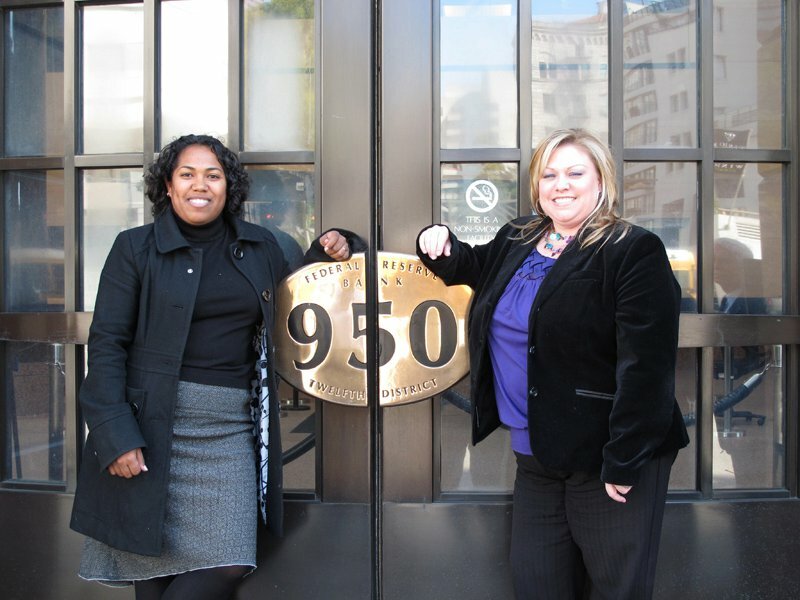 Abby Ulm, Foundation Manager at SCE Federal Credit Union, and Shay Olivarria at the Los Angeles Federal Reserve during a field trip with local high school students. More great news! SCE Federal Credit Union Foundation (now the Center for Financial Empowerment) works with several high schools around the San Gabriel Valley and in the 2012 National Financial Capabilities Challenge 24 of the 415 students nationwide (that’s about 6% of ALL the students across the nation) were students that SCE Federal Credit Union Foundation worked with! In 2012, 35 schools in California took the challenge (that’s about 67% of all schools in California) and the students that SCE FCU Foundation worked with scored really well. In fact, there was an increase of students that scored in the top 20% in year two. Congrats to all the students and the team at the SCE Federal Credit Union Foundation!